The system is a bespoke system, designed to suit each application but is based on a basic design, offering next-generation solutions for all needs. It is designed and manufactured fully compliant in accordance with the necessary standards and regulations, and is also fully compatible with the Renewable Heat Incentive scheme and also Renewable Obligation Certification scheme, providing not only a complete energy solution, but a system with an outstanding pay back on investment, making it a very attractive investment opportunity, not only for end users, but for energy providers. The modules are designed with various output options, dependant on the application. It can be a hot water lead design with a large proportion of the energy used to heat domestic hot water, such as in a leisure centre or process application. It can be a heating and cooling lead system with a lower instantaneous energy demand on the hot water, such as a hotel, where storage cylinders can be fitted to cover peak demands. 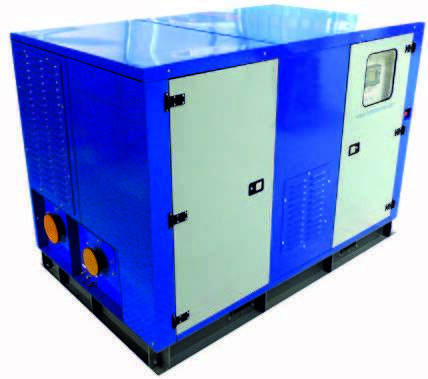 The QuadGen can also be designed for bespoke applications where steam is utilised or a single heated medium. The boiler is fed by an external silo by a feed system. Steam is produced burning the wood pellets in the boiler and controlling the water level. The boiler is supplied with all associated controls and equipment, as shown in the specifications shown later in the presentation. The steam is fed into a highly efficient electrical generator which acts as a pressure reducing system. 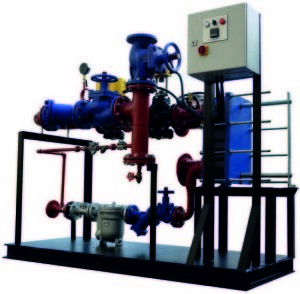 The lower pressure steam is utilized in either of the mediums as required. all necessary controls and safety equipment to enable self-operation. The boilers are fitted with high quality pellet fed burners and controls and produce up to 2mW per boiler with steam at 16 BarG. The boiler is fed by an integral hotwell within the plantroom and is also connected to a blowdown system, as in a standard steam boiler. The electricity is generated by a steam expander generator. The system is highly efficient with minimal losses and is supplied with all safety and control features. The system produces sufficient electricity to power the plant room with all excess power fed into the building electrical system. The electrical package is provided with all necessary equipment and export meters to ensure any electricity can be sold to the grid when required. For the generation of heating water, either low (LTHW) or medium (MTHW), the system uses the steam with HevaSteam packages supplied by Arbe Integrated Engineering. The HevaSteam unit is a self-contained unit, with all the required equipment and controls to ensure safe & efficient operation. The unit is supplied with a steam trapping system as standard. The steam is controlled by electro-magnetic control valves and electrical high limit safety shut-off valves. 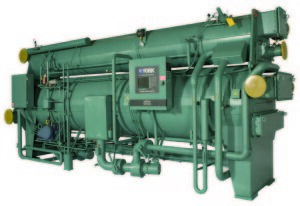 Chilled water is produced by steam absorption units. The high efficiency single-stage absorption refrigeration cycle uses water as the refrigerant and lithium bromide as the absorbent. It is the strong affinity and ease of separation that these two substances have for each other that makes the cycle work. The entire process occurs in hermetic vessels in a near complete vacuum. By using the environmental friendly ADVAGuard 750 inhibitor the internal corrosion rate and hydrogen generation is up to 8 times less than using lithium molybdate.